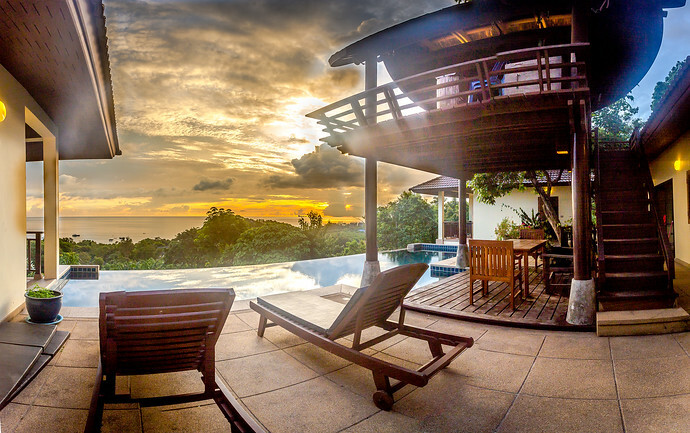 Villa Serene offers total privacy with breathtaking seaviews and a large 13 metre private infinity pool. 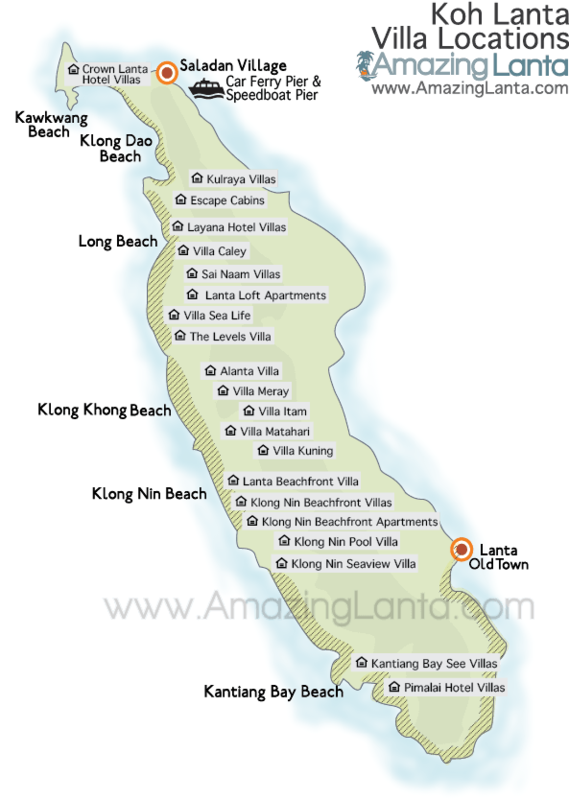 It’s located in Koh Lanta’s Kantiang Bay, one of Thailand’s most beautiful beaches. Refundable Deposit In Case Of Damage: Upon arrival a 10,000 Thai Baht deposit is also required in case of damage to the villa. This deposit will be refunded after your stay minus any damage costs. 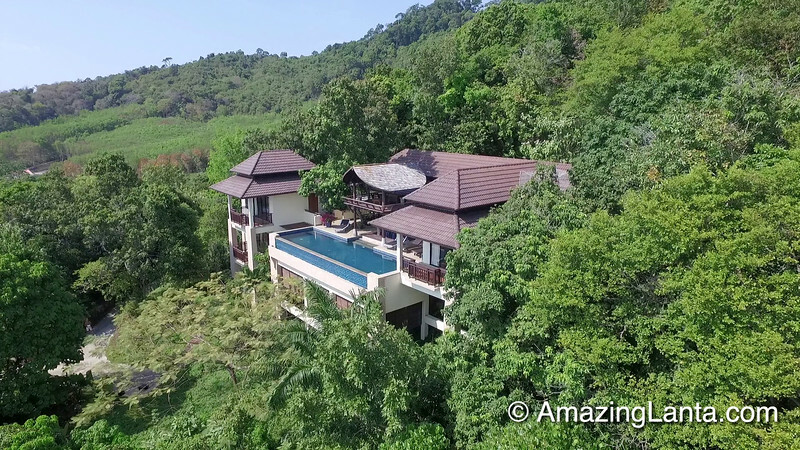 Villa Serene is set on a small secluded hillside in the heart of Kantiang Bay, widely recognised as one of Thailand’s most beautiful beaches. It’s not visible from the roadside and until you’re very close on the private drive up to the villa. Only then do you see its impressive design appearing amongst the trees. You will already have had a glimpse of the villa’s breathtaking ocean views. The villa is mainly set out on one level. The main section of the villa houses a huge master bedroom with private terrace walk-in wardrobes and ensuite bathroom. The open plan lounge area with dining area and kitchen are set an oblong shape. Plenty of windows let you enjoy the sea views from every room. A small toilet can be found on this level and hidden away are utility facilities near the kitchen. Going past the kitchen you will find a smaller air con bedroom with ensuite bathroom. Although it’s not as grand as the other rooms, it does make a perfect bedroom if you have children. Outside near the villa is a double storey structure housing 2 bedrooms. The bedrooms are not connected to the villa, but it is only a few meters away and the lower level bedroom is connected by outdoor stairs. Both bedrooms are very big and set out exactly the same and both have ensuite bathrooms. All 3 double bedrooms have stunning ocean views and a private terrace to relax on, the smaller bedroom near the kitchen enjoys tropical forest views. 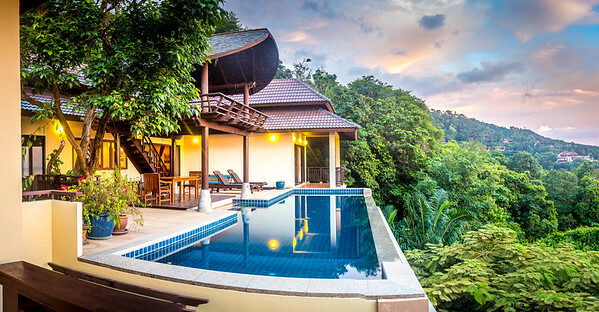 A perfect place to watch Koh Lanta’s spectacular sunsets is from the 13 metre infinity swimming pool. The villa also has outdoor sun loungers, dining area and a sala to keep cool in which includes hammocks. The villa complex is totally private you will not be disturbed by any person or noise but is still only a 10 minute walk away to Kantiang Bay. This is the perfect villa for holiday with family and friends with large indoor and outdoor recreational areas and the bedrooms separated from each other giving you somewhere to escape. 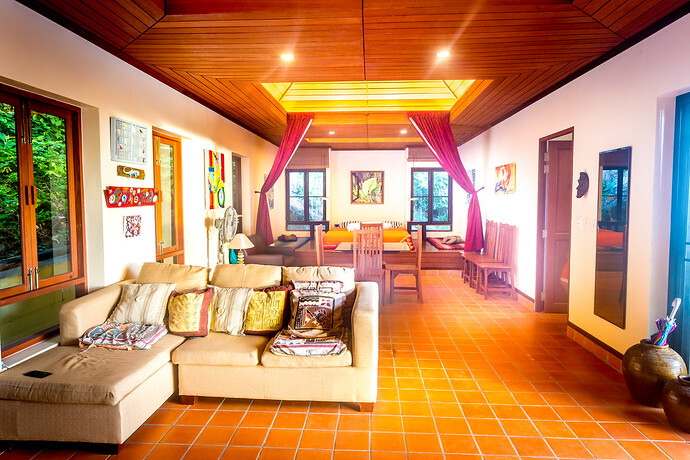 Inside the villa are the lounge and dining area, set out in an oblong shape. The area is all open plan and with high raised wood panelled ceiling creating a natural large space feeling. from the lounge area you have direct access to the pool area. At the back raised up is a bed and lounge area with pillows, this also has a curtain if you need a little peace or privacy. The inside dining area allows 8 guests to enjoy a meal together, although if the weather is fine dining outside will be better. The kitchen sits off the lounge and has been separated slightly with a small counter which can act like a breakfast bar. 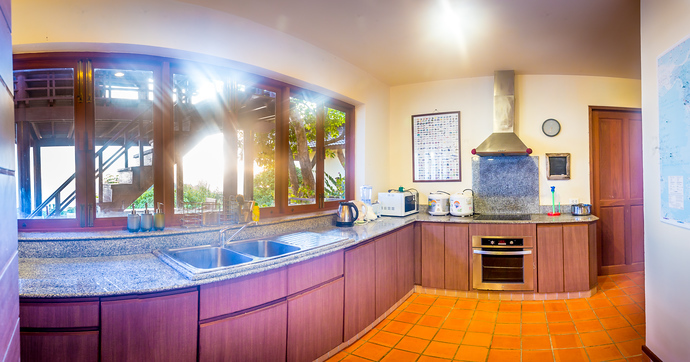 It is fully equipped for all your needs and includes rice cookers, oven, large fridge freezer, microwave, blender, kettle toaster and utensils. Granite worktops offer plenty of space to prepare the food. Hidden away you also have a dishwasher and washing machine. The master bedroom can be accessed by walking past the dining area. It’s the biggest room by far, with dramatic ocean views and and outside terrace to find solitude on. Behind the bedroom is a walkway to the ensuite bathroom. The walkway has double sided fully fitted wardrobes and drawers and space for your luggage. The master bedroom bathroom is also the largest of all the bathrooms and offers a bathtub with ocean views. No curtains are required as no one can view the bathroom, sit back and relax whilst enjoying the views. The bathroom also has a separated rain shower, wash basin and toilet – with plug sockets for shavers. The double air con bedrooms which sit off the villa are both identical in size and decor. They are built one of top of the other and outside stairs go to the lower level bedroom. 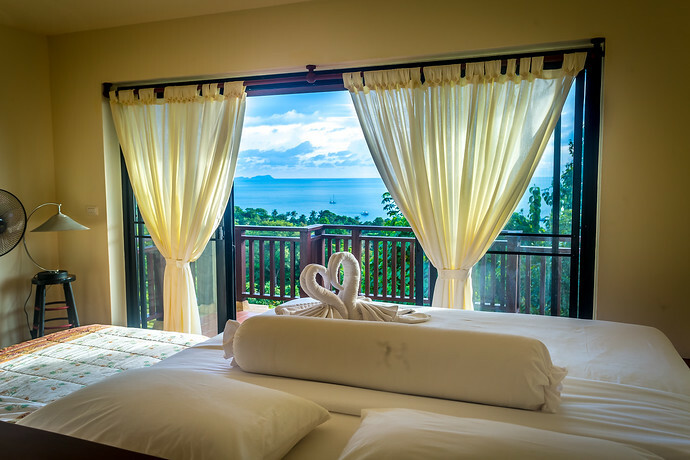 Both bedrooms face the ocean offering amazing views and have a private terrace so you can enjoy a little private time. Behind the double beds are built in storage areas and a built in wardrobe along one wall. 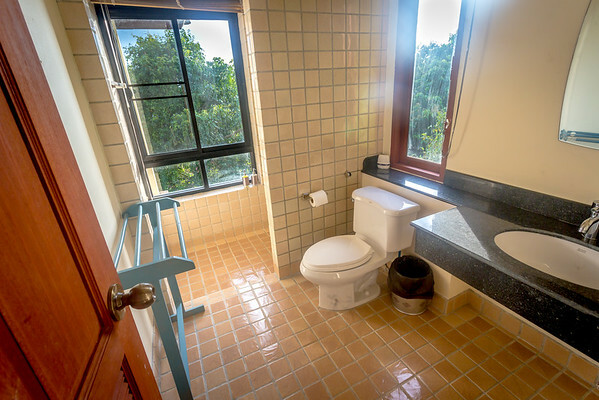 Both the ensuite bathrooms have a granite top surfaces, western toilets and a separated rain shower. plug sockets for shavers. The fourth bedroom near the kitchen area has just been renovated and we are awaiting pictures. It is smaller in size and offers forest views. It is air con and enjoys an ensuite shower room, although he shower is only a normal shower. It is a great room for children. Outside you can enjoy sun loungers by the pool and an outdoor dining area which can be moved for shade or in the sun. The two storey sala offers the best shade and is a great place to keep cool in the day relaxing in a hammock. Wherever you sit, you will have unobstructed views of the stunning horizon and bay. The amazing 13 metre infinity pool is a perfect place to watch the the skies ambiance of colours at sunset and is one of the best pools in a villa on Lanta. What’s Nearby To The Villa Serene? 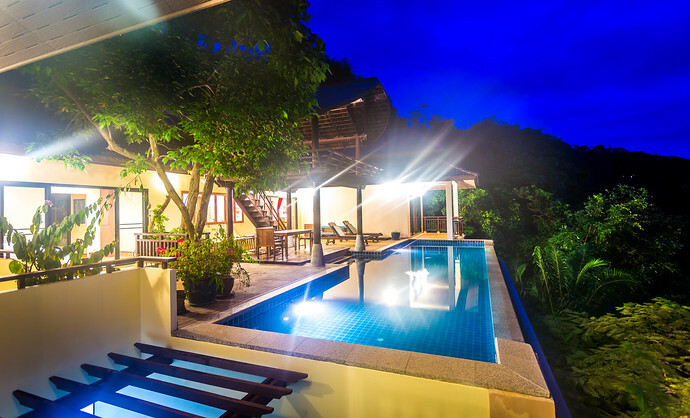 The Four Bedroom Villa Serene is located 10 minutes walk from Kantiang Bay, which has been voted as one of the Top Beaches in Thailand. The roads to the villa are all concrete roads except it is based on a hill. Walking down into Kantiang Bay is quite easy as it’s all downhill however going home up the hill is somewhat more challenging. Therefore, when staying here hiring a motorbike or car here is strongly recommended to get around or a simple taxi ride home from the beach. At night time part of the road to the villa is not lit so carrying a torch is recommended (or use the torch function on your smartphone). Walk to the main Kantiang Bay roadside to enjoy many restaurants. Close to Villa Serene is Drunken Sailors Coffee Shop. A laid back cafe where you may get stuck all day lounging in hammocks with a large menu of burgers, pasta, Thai classics and great coffee. Just before that is the A La Carte restaurant offering BBQ fish and papaya salad – all Thai classics. Walk toward the beach and enjoy a seafood BBQ at the Bay Front restaurant located on the beach at the Baan Laanta Resort. A nice walk then left along the beach and you can enjoy the Same Same But Different Restaurant.